Blacktype have a promotion that runs every week from Monday 00:00 to Sunday 23:59 whereby you bet 10 x £10 and receive a £10 free bet. You can do this five times (so 50 x £10 for £50 free bets - paid out every 10 bets you place). This offer isn't great but still worth it if you can find close matches and can most certainly be combined with other offers. All events and markets eligible. 50 bets a week is a lot so you don't always have to do the maximum. To trigger the £10 free bet, you must place 10 bets of at least £10 at odds of 2.0+. The easiest way to do this is to complete other Blacktype offers and note down how many bets you placed at 2.0+. Then towards the end of the qualifying period place the remaining amount of bets to the nearest 10. So if you've placed 8 bets that week, place 2 more for the £10. If you'd placed 17 bets, place 3 more for £20. If you'd placed 39 bets, place 1 more for £40 etc. Open up Blacktype and your exchange and find a close match between the back and lay odds for any event and any market. Alternatively you can use Oddsmonkey's Oddsmatcher and filter out Blacktype. Instead of looking for a match you can combine this offer with other Blacktype offers, so long as bets are placed and settled within the qualifying period. 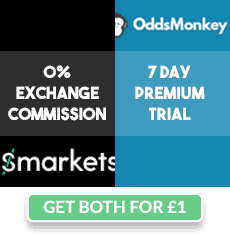 Bet £10 on Blacktype on the market of your choice. After your bets have settled you will receive a £10 free bet for every 10 bets (up to £50 / 50 bets) that can be used on any market. You can receive a maximum of £50 in free bets a week - £10 for every 10 bets you place. £2600 in free bets a year is equivalent to around £2000 cash. If you're combining with other offers then it's a free £2000 you would never have had! Blacktype have regular price boosts and mid week offers such as 2nd to SP fav (horses). Combine with these and then on the 6th day see how many more bets you need to place and finish them.